Iranian women weren't always required to wear a hijab. The hijab is not simply a veil. It is a symbol of the Islamic principle of modesty to some. It is a symbol of female oppression to others. This is what the Quran has to say specifically about women's dress: "They should not display their beauty and ornaments except what (must ordinarily) appear thereof; that they should draw their veils over their bosoms and not display their beauty except to their husbands." There are exceptions, like not having to wear the hijab when around certain male relatives. Enforcement of the hijab in Iran — that is where controversy comes in. In 1925, "Reza Shah rose to power and a new era began, marked by a turn from old customs toward Western ways of thought." In the 1930s, the hijab was banned in Iran as part of a modernization effort. During the Iranian revolution four decades later, 1978-79, publicly wearing a hijab actually became a symbol of protest against the monarchy. But wearing one was voluntary at that point, not compulsory for protesters. That changed on March 7, 1979, when Ayatollah Khomeini, Iran's revolutionary supreme leader, made the garment mandatory. He called unveiled women "naked." The next day, International Women's Day, thousands of women protested in the streets. Khomeini's original hijab mandate was officially put into law in 1983. Article 102 of the Penal Code stated, "Women who appear in public without religious hijab will be sentenced to whipping up to 74 lashes." The law was later revamped and added a penalty of imprisonment — anywhere from 10 days to two months — along with a stiff fine. There have been protests from time to time since 1983. And many women challenged that law in the late 1990s during a moderate presidency. They showed hair and wore Western-style clothing along with the hijab. Overall, adherence to the laws has slipped through the years. Many women have donned colorful head scarves or let them drop entirely — particularly in wealthier areas. And since Hassan Rouhani came to power in 2013, there are fewer government-backed morality police enforcing clothing rules. Still, the law does persist on the books. 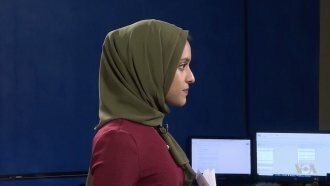 And despite an announcement in December that women without hijabs would not be arrested and instead sent to classes on Islamic values, there have been arrests. Followed by more protests, including women taking off their hijabs and waving them on sticks in the air like flags. Social media is helping spread the resistance across the country. The question is: Will the protests ultimately lead to heavier enforcement, or will authorities choose to look the other way? And will a generation of women with no personal memory or experience with the revolution ever back off their protests and claims to their personal and religious rights?